ALAC (Apple Lossless Audio Codec) is an audio format built into iTunes 11 that produces lossless audio files. This is an ideal format to use when making perfect copies of your original music CDs for archival purposes. It still compresses the audio (similar to other formats like AAC, MP3, and WMA), but doesn't eliminate any audio detail. As well as being a great alternative to the FLAC format, ALAC is also a convenient option to choose if you've got an Apple device. It's built right into the iPhone, iPod Touch, and iPad and you'll be able to directly sync your lossless songs straight from iTunes -- there's no messing about converting to AAC for example. You'll then be able to listen to perfect rips of your music CDs and perhaps hear audio detail that you've never heard before. For the Windows version of iTunes, click the Edit menu tab at the top of the screen and then choose Preferences. For the Mac version, click the iTunes menu tab and then choose Preferences. Ensure you are viewing the General menu screen. If not, click the General menu tab. Find the section called, When You Insert a CD. Click the Import Settings button. You'll now see a new screen displayed that gives you options to change the rip settings. By default, the AAC Encoder option will be selected. Change this by clicking on the drop-down menu and choose the Apple Lossless Encoder. Click the OK button to save your selection and then OK once more to exit the preferences menu. By default when a music CD is inserted into your DVD/CD drive, the iTunes software will automatically ask if you want to import the disc into your iTunes library. Click the Yes button to start the ripping process. If for some reason you want to interrupt the ripping process you can click the Stop Importing button which is situated near the top right-hand corner of the screen. To begin again, click the Import CD button (top-right of the screen). Once all the songs on your music CD have been imported, switch back to your iTunes library by clicking the view mode button (up/down arrows next to it) near the top-left of the screen and choose Music. You should now see the name of your imported CD in the Albums view. If you didn't get an automatic prompt screen to import the music CD you inserted (as in the previous section) then you will need to do it manually. The first thing you will need to make sure of is that you are in CD view mode. If not then click the button near the top left-hand side of the screen (this is the one with the up/down arrow) and choose the name of your CD -- it will have a disc icon next to it. If you've got the sidebar enabled in iTunes then simply click your music CD (under Devices in the left pane). On the right-hand side of the screen (underneath the iTunes Store button) click Import CD. 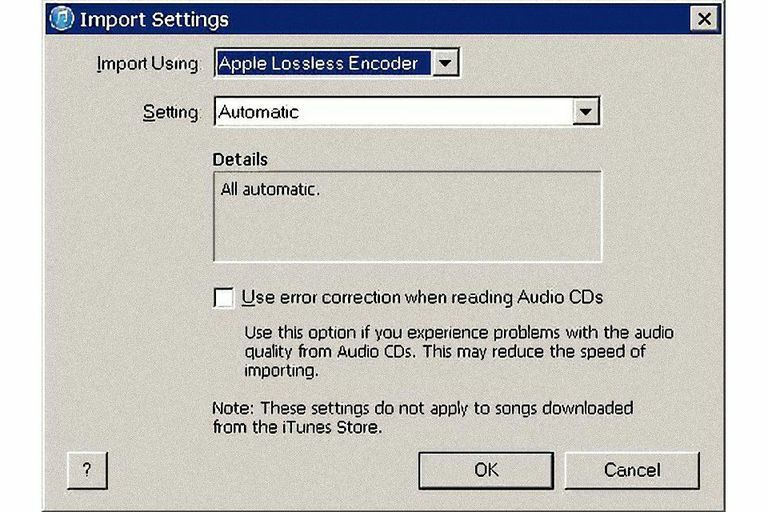 Check that the Apple Lossless Encoder is selected and then click OK. The music CD will now be ripped using the ALAC format. Once the ripping process is complete switch back to your music library (using the view mode button again) to check that all the songs from the CD have been imported.